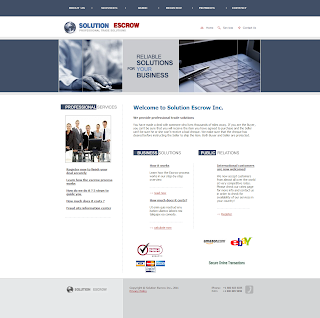 Solution Escrow Inc. is a fake escrow company targeting eBay sellers. When you sign up for this or any fake site you are giving your imformation to criminals. and asking intended victims to ship items to Spain. according to the Buyer's and Seller's instructions. 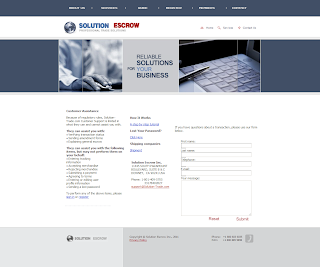 Solution Escrow Corp. services are provided by a licensed and regulated escrow agent. other high-ticket items. When to use another payment service: If you know the other party involved in the transaction, or the merchandise can be personally delivered. With Solution Escrow Corp. , every step in your transaction is verified with proven tracking and verification procedures. It is very easy to use the our services, just follow the steps below! terms of the transaction, we will ask the Buyer to pay Solution Escrow Inc. . Step 2: The Buyer pays Solution Escrow Inc.
information on the address where the goods are to be sent. All the information needed should be obtained by entering the appropriate transaction page. Seller has, after receiving the goods, the Inspection Period to verify that the goods have been returned in their original condition. After the Seller has confirmed the receipt and that the condition of the goods are to his/her satisfaction, Solution Escrow Inc. will reimburse the Buyer minus the fee due. not given any notification within that period of time.